How Can Data Drive Decision-Making in Corporate Responsibility? Every action is a data point. And in a world where you can do pretty much anything from your smartphone, we are constantly creating and cultivating an increasingly data-driven society. Today, you can track everything from your daily steps to profile views, while brands can measure everything from page clicks to purchases. With all of this noise constantly competing for our attention, how do we separate what’s important from all the rest? At Nielsen, we’ve been focused on leveraging consumer data to create actionable insights for our clients for almost a hundred years. Our corporate responsibility (CR) program was built on this legacy of using data to drive decision-making. Since 2010, our focus has grown from engaging employees through volunteer programs to monitoring the environmental, social and governance (ESG) issues that matter most to our stakeholders and to our company. We do this by empowering our people to design and implement the programs and policies that advance our company and have an impact on the communities where we operate. Clients, investors, employees and the general public are increasingly focused on the corporate responsibility issues that matter most. Recognizing the unique intersection of industry concerns and a company's core competencies drives a more comprehensive understanding of what’s most material to a company and its stakeholders. For Nielsen, these material issues include areas like data privacy and security, greenhouse gas emissions from energy and travel, supply chain responsibility and our employee experience. Having a fundamental understanding of the most material issues unlocks the potential to drive business opportunities and create shared value for your organization. Like many companies, we’ve made a conscious decision to expand the umbrella of corporate responsibility — moving it from a “nice-to-have” to a core contributor and factor in our long-term viability. Our CR team operates as a key business partner for various groups across our business, such as human resources, vendor management, investor relations and environmental sustainability. To help manage these diverse needs, we’ve developed an extended network of leaders across the business focused on collaboration to ensure that we are regularly thinking and acting responsibly and sustainably in all that we do. With this mission in mind, data presents a unique opportunity to focus on measuring what matters — and to do so through the lens of longevity and collaboration. Internally, this means raising the mirror to our own practices — emphasizing the need for continuous improvement and increased transparency. But we’re not just asking ourselves. We want to know what data matters most for our clients and communities in order to collectively address social challenges. 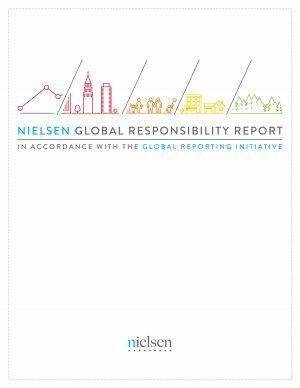 In our first Nielsen Global Responsibility Report, we recognize that measuring what matters is not only key to our business’ value proposition but also essential to how we can improve our own performance. It's our core belief as a company: that transparency and measurement create value. When we set out to put together this first report, aligned with the Global Reporting Initiative (GRI) G4 standards, we knew that the data we had about our own programs and operations could unlock new opportunities: reducing emissions and energy use at data centers; using the power of analytics to enhance ongoing talent development, retention and recruitment efforts; and instituting ESG requirements for top suppliers. Working together to collect and analyze our data created opportunities to improve existing programs and start new ones. We have not only been able to better respond to our stakeholders’ concerns, but we can also unearth new opportunities that weren’t previously considered. Evolving and responding to the forces of the future is not optional. In order to create value for our stakeholders today, data is a key driver to identify areas of improvement, measure our progress, and increase our ability to stay nimble and do more. We recognize that this isn’t a linear process, and we won’t get there alone; we won’t do it all in 2016, either. With long-term goals in your purview, it’s critical to create an overall structure today that will enable success tomorrow. Nielsen is not alone in these efforts. The Government & Accountability Institute has noted a rise in sustainability reporting from just 20 percent of companies in 2011 to 81 percent in 2015. While the business case for sustainability is becoming an easier sell, investors, clients and employees want more out of those sustainability reports than they did even a couple of years ago—especially more clear, concise information about how and why your company provides real long-term value as an investment, supplier and employer. Data as a critical part of our sustainability strategy is here to stay — whether it’s the data and expertise we provide to nonprofits through Nielsen Cares with skills-based volunteering and in-kind giving, or the collection and analysis of our own data to help us make better, more informed decisions about how to operate our company more responsibly and sustainably. The question for companies like ours is not whether we measure our efforts, but how we measure what matters most to our stakeholders and the communities we serve. Crystal Barnes is the vice president of corporate social responsibility at Nielsen.